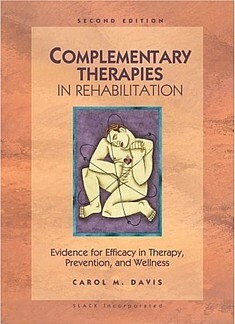 Complementary Therapies in Rehabilitation has been revised and updated to include the latest information about holistic therapies and evidence of their efficacy. This comprehensive edition makes complementary therapies easy to understand and assess for rehabilitation practitioners, students, and health care professionals interested in keeping pace with this new trend and its emerging importance. Written by experienced therapists who have been studying and practicing these holistic methods, this evidence-based text includes an insightful review profiling the research of holistic approaches commonly used in rehabilitation. Students and practitioners are now able to evaluate the efficacy of these approaches from the evidence that is reported. The clearly written chapters cover an array of topics including myofascial release, taiji, yoga therapeutics, and Pilates rehabilitation. Each of the various therapies is described from a historical and theoretical base, and clinical applications are made using case studies. Complementary Therapies in Rehabilitation is a must have for all rehabilitation professionals eager to restore sincere helping and healing to the health care community.